The nights are getting longer and the days are getting colder, and the only upside to winter is being awake for the sunrise. Day after day we are treated to these gorgeous sunrises. This one was particularly incredible. We also had our first Snow. We got about 2 cm of snow, a little less than an inch, but it was gone by the next day. Luna thought it was pretty swell, and she kept dive bombing into the tiny bits of snow on our walks - i can't wait to see what she does when we get a good dump of snow. She doesn't seem to care that i'm cold. I got to see some of my old friends from back when i had a job. lol. This sculpture is called Prairie Wind, and the lights change colour. Being cute, it's what we do. 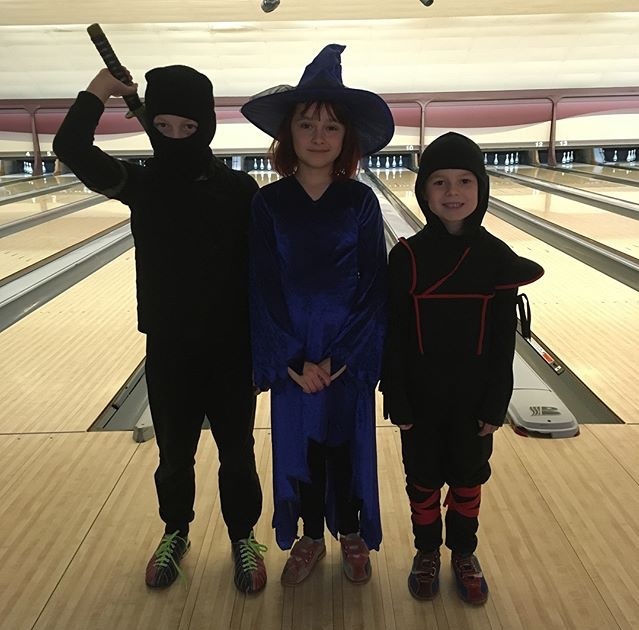 Bowling this week was Halloween themed, and so Batman, a Witch, and Mario had fun together. As well as this little witch and her two Ninja friends. Artoo won Bowler of the Week, so he was really excited about that! I'm really glad that he's having a great time bowling in a league. Both of them. Every year i think i'm going to be the one who goes all out and creates a really awesome costume, but inevitably that never happens. But the boys are pretty pumped about it, and why wouldn't they?? free candy? I used a bit of acrylic gold ink in the background of my tile. I know there was a bit of lag, i'm sorry about that. I'm not really sure how to fix that, but it doesn't seem to be a problem when i just record instead of stream. And if you're on the Zentangle Mosaic App or Instagram - i'm @iamthediva - come on by and follow me, and i'm going to be using hashtags on the app for each of my weekly challenges. So if you're game - use the hashtag #DC339(Diva Challenge #339) for your tile this week! You can also search in the app for people's contributions to the challenge by clicking on the hashtag from inside the app, or using the search function. Great photo's of the boys! I love your tile with those bars before the yellow! Looks like a fun challenge. But I am so busy right now and stressed out from all the stuff that's happened the last month, including the fires here in Sonoma County that were within a few miles of my place. I will be following and probably doing the challenges but won't be posting for awhile. I've got a big crochet project I'm doing for my niece for Christmas (a Queen size afghan in Tunisian Crochet) and am trying to get as much done as I can this next month. The Holidays are coming up fast now. YIKES! It's Halloween already!! That's scary. LOL Thanks for all you do. I'll keep following your YouTube channel too. Ooooops! I accidentally posted the same thing twice. Sorry. Thanks for giving us some leeway on this. I love Fall colors and themes but Halloween? not so much anymore. I love your post. You guys are all adorbs! First time joining this challenge, look forward to joining many more. I'm a complete novice, but really enjoying it!